Michael DeWayne Brown served as the first Undersecretary of Emergency Preparedness and Response, a division of the Department of Homeland Security. This position is generally referred to as the director or administrator of the Federal Emergency Management Agency. He was appointed in January 2003 by President George W. Bush and resigned following his controversial handling of Hurricane Katrina in September 2005. 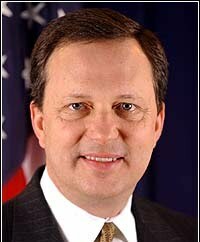 Brown first had been appointed as General Counsel at FEMA. After the 9/11 terrorist attacks President Bush nominated Brown to become Deputy Director of FEMA. Brown currently hosts a radio talk show on 630 KHOW in Denver, Colorado.